2019 Camp Registration is open now! Click the RP numbers in the tabs below to sign up online! Detailed Information and camp participant forms are mailed to registrants approximately two weeks prior to the start of each camp session. Common forms can be found at the bottom of the page - medication (including Epi-pens and inhalers) sent to camp MUST be accompanied by a Medication form signed by a physician. FAQs for Adventure & Outdoor camps listed at the bottom of the page! Campers must be signed in and out of camp each day. For the safety of your child, staff will only release campers to the parent, guardian or those individuals listed on the Participant Information form. Please be prepared to show a government-issued photo ID when you pick up your child. Special accommodations are available but not guaranteed. Requests must be made at least two weeks in advance. Participants must be able to pass a basic swimming test to participate in camps that involve swimming/river activities. Most camps are held rain or shine; schedule subject to change with alternate activities. Camps below are listed by age. For a complete list of ALL Howard County Recreation & Parks Camps, visit howardcountymd.gov/camps! Don't miss the Ultimate Fishing: Shore & Boat Adventure this August! *Please note: This page is for informational purposes, but details and schedules may change. Adventure & Outdoor camp letters and forms with the most current information are mailed to registrants pproximately two weeks prior to the start of camp. Call 410-313-7275 or click on the RP numbers in the tabs below to register online or check for openings. Camps below listed by age range. CLICK HERE for a PDF listing the Adventure & Outdoor camps by week! You can also use the search filters in our online registration system to search by week, age, etc. See directions inside the Recreation & Parks Camp Guide! Interested in working outdoors this summer and sharing your love of Adventure & Outdoor Recreation? Visit the main Howard County site for a complete listing of positions available (www.governmentjobs.com/careers/howardcounty)! Click the RP number above to sign up online! The recommended attire for the camp is a T-shirt, quick drying shorts, socks and athletic shoes. Eat a quality breakfast each morning. Bring a water bottle. Please do not bring any food that contains peanut or nut products (other children may be allergic). No cell phones or electronics allowed in camp due to the nature of the activities. The Camp Director will have a camp cell phone available for all emergencies. Please note: This schedule is subject to change! Meadowbrook Athletic Complex - 5001 Meadowbrook Lane, Ellicott City, MD 21043. From Route 29, exit Route 100 East. Exit onto Long Gate Parkway (the first exit). Stay straight at the end of the exit ramp. After passing the Park & Ride, turn left into the Meadowbrook Park entrance. Click on the RP numbers above to sign up online! The recommended attire for the camp is a T-shirt, quick drying shorts, socks and athletic shoes (no open-toes sandals or Crocs). Eat a quality breakfast each morning. Bring a small daypack with a reusable water bottle and a non-perishable snack. Please do not bring any food that contains peanut or nut products (other children may be allergic). In an effort to encourage environmental conservation, we ask that campers take their trash home. No cell phones or electronics allowed in camp due to the nature of the activities. The Camp Director will have a camp cell phone available for all emergencies. Tuesday: Review range rules / Archery practice / The greater world of Archery! From I-70 Westbound: From I-70 (coming from Rte 29) take Exit 83 onto Marriottsville Road northbound. Proceed 0.9 miles and turn left onto Old Frederick Road (Rte. 99). Proceed 0.5 miles to park on the left. Once in Park, make 2nd left into the large parking area. From I-70 Eastbound: From I-70 take Exit 82 onto eastbound Route 40. At first traffic light turn left onto Marriottsville Road northbound. Proceed 1.5 miles and turn left onto Old Frederick Road (Rte 99). Proceed 0.5 miles to park on the left. Once in Park, make 2nd left into the large parking area. Do you love collecting rocks? Join other little "rockers" making rock candy, starting your own rock collection and trying indoor rock climbing! Schedule is subject to change. Fee includes supervision and activities. Bring a non-perishable snack (no nut products) and beverage. For more information, contact Matt Medicus at 410-313-1769. Eat a quality breakfast each morning. Please bring a small daypack with a full reusable water bottle and a non-perishable snack. Please do not bring any food items that contain any peanut or nut products (other children may be allergic). No cell phones or electronics allowed in camp due to the nature of the activities. The Camp Director will have a camp cell phone available for all emergencies. A full schedule of activities will be given to parents on the first day of camp. The recommended attire for the camp is a T-shirt, quick drying shorts, socks and athletic shoes. Take Route 29 to Route 108 West. Follow Rte 108 past the entrance to Centennial Park East to the stoplight across from Ten Mills Road. Turn right into the park. Once in the park, make the first right – Pavilions E, F & G will be on your left after you pass the boat ramp parking area. Water, water water; it's all about water in this camp! Learn about water cycles, aquatic life and floods through fun, wet, hands-on water games. Activities include water pinatas, beaver dams and a surprise visit from the swamp monster! Schedule is subject to change; camp is held rain or shine. Fee includes supervision and activities. Bring a non-perishable snack (no nut products) and beverage. For more information, contact Matt Medicus at 410-313-1769. This camp does NOT require a swim test and does not include swimming. Take Route 29 to Route 108 West. Follow Rte 108 past the entrance to Centennial Park East to the stoplight across from Ten Mills Road. Turn right into the park. Once in the park, continue on the park road to the parking area at the end. Pavilion A will be on the far left of the pavilions to the left of the playground. Learn what a Howard County Park Ranger does through hands-on outdoor activities with our Park Rangers. Activities include fishing, canoeing, archery, games and making your own archery bow and fishing pole. Learn about park wildlife, fire starting and campfire safety. See the techniques and tools the rangers use to enforce park rules, save wildlife and make the park a safe, fun and enjoyable place to visit. Receive a Jr Park Ranger Uniform Shirt to wear to camp and at the conclusion of camp, a Jr Ranger Badge and certificate. Schedule is subject to change; camp is held rain or shine. Fee includes bus or van transportation, supervision and activities. Bring a non-perishable lunch (no nut products) and beverage. Info: Dawn Thomas, 410-313-1754. Click the RP number above to sign up online. Eat a quality breakfast each morning. Please bring a small daypack with a full reusable water bottle and a non-perishable lunch. Please do not bring any food items that contain any peanut or nut products (other children may be allergic). No cell phones or electronics allowed in camp due to the nature of the activities. The Camp Director will have a camp cell phone available for all emergencies. A full schedule of activities will be given to parents on the first day of camp. Enjoy the sport of fishing while learning why and when fish bite. Discover when to use natural and artificial bait, and prepare to go after the biggest fish out there! Bring your rod and artificial lures; natural bait is provided. Bring a snack and beverage (no nut products). For more information, contact Dawn Thomas at 410-313-1754. Click the RP number above for online registration! The camp will run 8:30 until 11:30am Monday-Thursday (M-W & F Week of July 2). Registration verification and camper check-in will take place on Monday morning as campers arrive. At the end of each camp day, campers will be back at Pavilion E. Each day a parent must sign in their child in the morning and sign them out at the end of the camp day. Campers must bring their own fishing rod, reel and tackle. Live bait will be provided. Bring a full reusable water bottle, non-perishable snack and drink each day. Do not bring any food items that contain peanut or nut products (other children may be allergic). The recommended attire for camp is a t-shirt, shorts, and close-toed shoes that can get muddied and wet. Billed caps and sunscreen are advised (please apply sunscreen and/or bug spray prior to camp). Join us for a full week of outdoor fun, surrounded by nature! Spend your days by Centennial Lake enjoying canoeing, nature hikes, swamp exploration, fishing, archery, group games, nature crafts and more. Schedule includes swimming on Monday and Friday. Bring a lunch and beverage each day (no nut products). Schedule is subject to change; camp is held rain or shine. Information: Matt Medicus, 410-313-1769. Click on the RP number above for online registration! The camp will run from 9:00am until 5:00pm each day. Registration verification and check-in will take place each morning as the campers arrive. Parents will receive a schedule of activities for the week on the first day of camp. Campers must be signed in and out of camp each day. The recommended attire for camp is T-shirt, shorts, long white socks and old sturdy sneakers. Billed caps and sunscreen are advisable. Please expect that sometimes these clothes will get wet and muddy. On the first day, campers should also bring a swimsuit and towel. A non-perishable lunch, drink, snack and full reusable water bottle should be brought to camp each day. Please do not bring any food that contains peanut or nut products (other children may be allergic); check all product labels to make sure. Please use a backpack to carry lunch and supplies. Take Route 29 to Route 108 West. Follow Route 108 past the entrance to Centennial Park East to the stoplight across from Ten Mills Road. Turn right into the park. Once in the park, make the first right – Pavilions E, F & G will be on your left after you pass the boat ramp parking area. Develop outdoor adventure skills, improve self-esteem and explore the natural environment with activities and games. 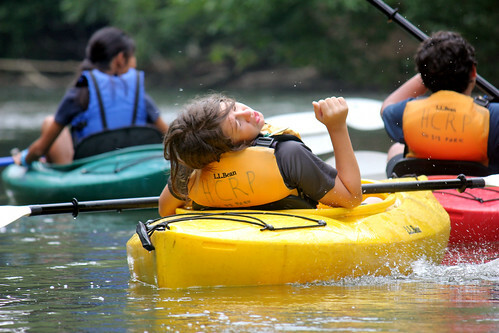 Learn basic canoeing skills on Centennial Lake, bike the Howard County pathways, participate in team building activities, go hiking, swimming and swift river tubing on a Maryland River. Camp prerequisite: must be able to pass a basic swimming test and have a well-maintained bike and bicycle helmet. Camp is held rain or shine – the schedule is subject to change with alternate activities. Fee includes bus or van transportation, supervision and activities. Bring a non-perishable lunch (no nut products) and beverage. For more information, call Dawn Thomas at 410-313-1754. Take a look at Adventures to Go on Flickr (click to see the full album)! Must be able to pass a basic swimming test on Monday. Must have a well-maintained bike and bicycle helmet. The recommended attire for the camp is a T-shirt, quick drying shorts, socks and athletic shoes. Eat a quality breakfast each morning. Bring a small daypack with a water bottle and a non-perishable lunch. Please do not bring any food that contains peanut or nut products (other children may be allergic). In an effort to encourage environmental conservation, we ask that campers take their trash home. There are no trash facilities at Antietam Creek (tubing) or some of the other activity locations. No cell phones or electronics allowed in camp due to the nature of the activities. The Camp Director will have a camp cell phone available for all emergencies. Days 1 & 2: Wear a bathing suit underneath your regular clothes and bring a towel. On Day 2, also bring a large plastic trash bag for wet articles after the tubing trip. Day 3: Bring a bike, bike helmet, bike water bottle and back pack. Review the bike to make sure it is working properly. Bring a spare inner tube in case you get a flat tire. Pack your lunch so it will fit in your backpack. Take Route 29 to Route 108 West. Follow Route 108 past the entrances to Centennial Park East to the stoplight across from Ten Mills Road. Turn right into the park. Once in the park, follow to the end of the road. Pavilions A, B & C are to the left of the playground. Take Route 29 to Route 108 East. Follow Route 108 approximately 1 mile to Red Branch Road. Turn left on Red Branch Road and follow until just before the “Top Flight Gymnastics Facility”. Turn right into Shadowland’s parking lot. The camp will meet rain or shine. For severe weather program changes, information will be available one hour prior to the camp start time on the Department’s program status line, 410-313-4451; press 4 for camps. The recorded message will reflect any change to the drop off location or time changes for the camp. If the weather is severe, we will arrange for indoor activities. If there is a threat of lightning, we will take cover in a shelter. If the paved trails are too wet for biking, we may switch that activity for hiking. Try your hand at two lifelong outdoor activities in this beginner camp! Discover and practice new skills in casting, fish identification and knot tying. Learn the essentials of target archery such as range safety, equipment use and technique from USArchery certified instructors. Camp includes trips to some special fishing spots where the fish are definitely biting! Bring a non-perishable lunch and beverage each day (no nut products). Schedule is subject to change; camp will be held rain or shine. Fee includes van or bus transportation, supervision, equipment and activities. Info: Matt Medicus, 410-313-1769. The recommended attire for the camp is a T-shirt, quick drying shorts, socks and athletic shoes. Eat a quality breakfast each morning. Bring a small daypack with a full reusable water bottle and a non-perishable lunch. Please do not bring any food that contains peanut or nut products (other children may be allergic). In an effort to encourage environmental conservation, we ask that campers take their trash home. No cell phones or electronics allowed in camp due to the nature of the activities. The Camp Director will have a camp cell phone available for all emergencies. Please note: This schedule is tentative and is subject to change! Day 4: Travel to a special fishing spot! Experience a camp that is packed with “old school style” games, sports and new adventures that will send your child home happy and excited for the next day. This camp offers a variety of activities including swimming, kayaking, fishing, archery, basketball, capture the flag, kickball, dodgeball, hiking and much more! Schedule is subject to change; camp is held rain or shine. Fee includes bus or van transportation, supervision and activities. Bring a non-perishable lunch (no nut products) and beverage. For more information, contact Dawn Thomas at 410-313-1754. Must be able to pass a basic swimming test. Meadowbrook Athletic Complex: 5001 Meadowbrook Lane, Ellicott City, MD 21043. From Route 29, exit Route 100 East. Exit onto Long Gate Parkway (the first exit). Stay straight at the end of the exit ramp. After passing the Park & Ride, turn left into the Meadowbrook Park entrance. Learn the importance of the bay and what people can do to preserve it through visits to the Calvert Marine Museum, Flags Pond Nature Park and Kings Landing Park. Swim and hike bay beaches, enjoy fishing and crabbing, take a boat tour of Solomon's Island and enjoy beach campfires while you camp on the beach Tuesday and Wednesday night. Campers must be able to pass a basic swimming test. Fee includes bus or van transportation, tent accommodations, supervision and activities. Information: Dawn Thomas, 410-313-1754. Click on the RP number above to sign up online! Campers must be able to pass a basic swimming test on Monday. The camp will begin at 9:00am on Monday morning. Registration verification and camper check-in will also take place on Monday morning as campers arrive. On Tuesday morning, we will meet at Centennial Park at 9:00am to load up and travel to Calvert County. This will be the first day of our two-night overnight. A parent must sign in their child on Monday and Tuesday, and sign their child out on Monday and Thursday at the end of the camp day. Eat a quality breakfast on Monday and Tuesday morning. Please bring a non-perishable lunch, drink and reusable water bottle both Monday and Tuesday. Please do not bring any food items that contain any peanut or nut products (other children may be allergic). Meals will be provided beginning with dinner on Tuesday through lunch on Thursday. The recommended attire for the camp is a t-shirt, shorts, socks, and athletic shoes. Please see the list mailed with your camp letter for camper supplies and materials. In addition to the items on the list, please bring one white shirt for tie-dying on Monday. Tentative Schedule - subject to change! Tuesday: Travel to Calvert County including a visit to Flag Ponds and the Kings Landing Pool. Set up camp at Breezy Point! Wednesday: Tour the Calvert Marine Museum and go on a boat tour! Thursday: Hunt for shark's teeth, play games on the beach, pack up and head for home! Take Route 29 to Route 108 West. Follow Route 108 past the entrance to Centennial Park East to the stoplight across from Ten Mills Road. Turn right into the park. Once in the park, continue on the park road to the parking area at the end. Pavilions A, B & C are to the left of the playground. Paddle your way through a fun and exciting introduction to two lifelong outdoor activities. Discover and practice skills in casting, knot tying and a variety of fishing techniques. Earn a flatwater basics paddling certificate from an ACA certified instructor, then combine those skills as you fish Centennial Lake by canoe! No experience necessary. Bring a non-perishable lunch (no nut products) and beverage. Camp is held rain or shine; schedule is subject to change. Fee includes van or bus transportation, supervision, equipment and activities. Info: Dawn Thomas, 410-313-1754. Must be able to pass a basic swimming test on the first day. Day 3: Fishing at other locations around the County! Calling all intermediate and advanced anglers! Enjoy the sport of freshwater fishing on lakes across Maryland. Go fishing in and on (by boat!) Centennial Lake on Monday. The real excitement begins on Tuesday while traveling to Western Maryland, hitting fishing hot spots along the way! Shoreline fish Deep Creek Lake and Herrington Manor State Parks on Wednesday and conclude this fishing adventure by boat fishing Deep Creek Lake on Thursday. Bring your rod and artificial lures; natural bait is provided. Fee includes most meals, transportation (bus or van), two nights tent camping at Deep Creek Lake State Park, supervision and activities. For more information, call Dawn Thomas at 410-313-1754. This camp is designed for intermediate/advanced anglers. The camp will begin at 9am on Monday morning. Registration verification and camper check-in will also take place on Monday morning as campers arrive. On Tuesday morning, we will meet at Centennial Park South Pavilion E at 8am to load up and depart promptly to travel to Western Maryland. This is the first day of our two-night overnight. A parent must sign in their child on Monday and Tuesday. A parent must also sign their child out on Monday and Thursday at the end of the camp day. All fish caught at camp will be released back into the waters (photos may be taken!). Eat a quality breakfast on Monday and Tuesday morning. Please bring a non-perishable lunch, drink and full reusable water bottle on both Monday and Tuesday. Please do not bring any food items that contain any peanut or nut products (other children may be allergic). Meals will be provided beginning with dinner on Tuesday through dinner on Thursday. The recommended attire for the camp is t-shirt, shorts, socks, and athletic shoes. Please see the list mailed with your camp letter for additional camper supplies and materials. Tentative Schedule: Please note: Schedule is subject to change! Monday: Orientation and fishing from shore and boat on Centennial Lake. Please pick up your child from Centennial Park South by 5pm. Tuesday: We will leave from Centennial Park Pavilion E at 8am, traveling to Rocky Gap State Park for lunch and fishing in the 243 acre Lake Habeeb. Then we continue our trek west to Deep Creek Lake State Park to set up camp. 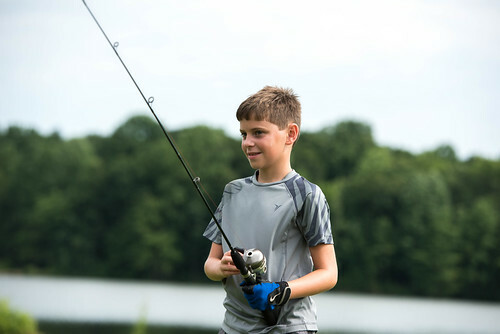 Wednesday: Campers will fish from shore in Deep Creek Lake (Maryland’s largest man-made lake) and Herrington Manor State Parks. Thursday: Fish Deep Creek Lake by boat, break camp, clean and pack up. Return to Centennial Park by 8pm. Take Route 29 to Route 108 West. Follow Rte 108 past the entrance to Centennial Park East to the stoplight across from Ten Mills Road. Turn right into the park. Once in the park, make the first right. Pavilions E, F & G will be on your left after you pass the boat ramp parking area. This is a beginner camp intended for those who are new to these activities and are looking for a positive experience with archery and kayaking. Learn basic kayak skills on Centennial Lake to prepare you for a river kayak trip. Archery instruction includes essentials such as range safety, equipment maintenance, self-analysis and archery etiquette. Bring a non-perishable lunch and beverage each day (no nut products). Schedule is subject to change; camp will be held rain or shine. Fee includes van or bus transportation, supervision, equipment and activities. Info: Dawn Thomas, 410-313-1754. Thursday: Paddling games and Archery Tournament! Take Route 29 to Route 108 West. Follow Rte 108 past the entrance to Centennial Park East to the stoplight across from Ten Mills Road. Turn right into the park. Once in the park, continue to the end of the park road – Pavilions A, B & C are to the left of the playground. This camp is for beginner and intermediate bikers and kayakers. Learn basic kayak skills on Centennial Lake to prepare you for a river kayak river trip. Bike the Columbia Pathways to prepare you for a 10-15 mile bike ride on the C&O Canal Towpath. Must have a well-maintained bike and a bicycle helmet. Schedule is subject to change; camp will be held rain or shine. Fee includes bus or van transportation, supervision and activities. Bring a non-perishable lunch (no nut products) and beverage. Information: Matt Medicus, 410-313-1769. Eat a quality breakfast each morning. Bring a small daypack with a full reusable water bottle and a non-perishable lunch. NO PEANUT OR NUT PRODUCTS are allowed in camp. In an effort to encourage environmental conservation, we ask that campers take their trash home. There are no trash facilities at many of the parks. The recommended attire for the camp is a T-shirt, quick drying shorts, socks and athletic shoes. No cell phones or electronics allowed in camp due to the nature of the activities. The camp director will have a camp cell phone available for all emergencies. Days 1 & 3: wear a bathing suit underneath your regular clothes and bring a towel. On Day 3, also bring a large plastic trash bag. Days 2 & 4: bring a bike, bike helmet, full reusable bike water bottle and backpack (no drawstring bags, please!). Before the week of camp, review the bike to make sure it is working properly. Bring a spare inner tube in case you get a flat tire. Pack your lunch so it will fit in your backpack. Take Route 29 to Route 108 West. Follow Route 108 past the entrances to Centennial Park East to the stoplight across from Ten Mills Road. Turn right into the park. Once in the park, continue on the park road to the parking area at the end. Pavilions A, B & C are to the left of the playground. Experience the excitement of Maryland’s great outdoors while building personal relationships and leadership abilities. Learn team building and problem-solving skills during a variety of adventure-centered activities. Learn basic canoeing skills, go swift river tubing on a Maryland river, go swimming, participate in a camping overnight, rock climb outdoors and challenge yourself on a high/low elements ropes course. Schedule is subject to change; camp is held rain or shine. Fee includes bus or van transportation, supervision and activities. Bring a non-perishable lunch (no nut products) and beverage each day. Information: Matt Medicus, 410-313-1769. Eat a quality breakfast each morning. Please bring a small daypack with a full reusable water bottle and a non-perishable lunch. Please do not bring any food items that contain any peanut or nut products (other children may be allergic). Dinner, breakfast, and lunch will be provided for the overnight camping trip. No cell phones or electronics allowed in camp due to the nature of the activities. The Camp director will have a camp cell phone available for all emergencies. Centennial Park South, Pavilion B – 10000 Rte 108, Columbia, MD 21042 Take Route 29 to Route 108 West. Follow Route 108 past the entrances to Centennial Park East to the stoplight across from Ten Mills Road. Turn right into the park. Once in the park, continue on the park road to the parking area at the end. Pavilions A, B & C are to the left of the playground. Join other teens for this total adventure challenge where you will gain confidence, build relationships and achieve your personal best. Go indoor and outdoor rock climbing, challenge yourself on a high elements ropes course and brush up on your archery skills. Spend Wednesday night camping at Genessee Valley. No experience necessary. Bring a non-perishable lunch (no nut products) and beverage. Camp is held rain or shine; schedule is subject to change. Fee includes van or bus transportation, supervision, equipment and activities. Info: Dawn Thomas, 410-313-1754. Sandy Springs Adventure Park & the Harpers Ferry Adventure Center use an online waiver system - check your email about 2 weeks prior to the start of camp for a link to our group's reservation page to sign the waivers electronically! Take Route 29 to Route 108 West. Follow Rte 108 past the entrance to Centennial Park East to the stoplight across from Ten Mills Road. Turn right into the park. Once in the park, make the first right. Pavilions E, F & G will be on the left past the boat ramp. You MUST bring this form, completed and signed, with you on the first day of camp. Without this form, we cannot accept your child at camp. Please notify the Camp Director in writing of any allergies or health concerns pertinent to your child’s camp experience. For the safety of your child, staff will only release campers to the parent, guardian or those individuals listed on the Participant Information form. Please be prepared to show a government-issued photo ID when you pick up your child each day. Sending medication to camp is highly discouraged. But, if it is necessary for medication to be administered during the operation of the camp, a Medication Administration Authorization Form must be filled out and signed by both the parent and a physician. A separate form is required for each medication. All medications must be in the original container with the medication name, physician’s name, dosage and expiration date. Please verify that you have the correct version of this form and it is signed and completed in full or we will not be able to accept the medication at camp. Unless the self-carry portion of the form is completed and signed by both a physician and a parent, all medications will be stored in a locked container with the Camp Director. Most Adventure and Outdoors Camps that go swimming visit the Greenbelt Aquatic Center, which has its own waiver. Click the name above to download a PDF of that form. Most Adventure & Outdoor camps will meet rain or shine (call camp supervisor for clarification). Activities or camp location may need to be adjusted depending on weather conditions. If there are any emergencies during camp, our first priority is the safety of the campers and staff. Emergency procedures are in place for all of our camps, however in the event that we need you to pick up your child, a HCRP staff member will contact you. For severe weather program changes, information will be available one hour prior to the camp start time on the Department’s program status line, 410-313-4451; press 4 for all summer camps. There will only be a message if there are any changes to the program location or schedule. If the weather is severe, we will arrange for indoor activities. If there is a threat of lightning, we will take cover in a shelter. Activity Schedules may be adjusted with alternate activities. *Please note: This page is for informational purposes, but details and schedules may change. Adventure & Outdoor camp letters and forms are mailed to registrants approximately two weeks prior to the start of camp with the most current information. Call 410-313-7275 or click on the RP numbers to register online or check for openings. My child is outside the posted age range for a particular camp. Can he/she still attend? Adventure and Outdoors camps must stay close to the posted age range for each camp. We believe you when you tell us that your child is very mature, big for their age, a strong biker, etc, but unfortunately the ages are posted for several reasons and generally age overrides are only approved if the child's birthday is within two weeks of the start of camp. Good question! Many Adventure and Outdoors camps take place exclusively outside, so adverse weather can be an issue. We monitor several weather information services, including the County's Office of Emergency Management, and will make appropriate changes to keep the camp safe. Many activities such as fishing and canoeing/kayaking will continue to run in light rain, or we may change the camp schedule with alternate activities if necessary. Camp directors will let parents know of any changes to the camp schedule and most full day camps will not cancel or end the camp day early due to the usual summer inclement weather. What is involved in the swim test mentioned in the camp description? For Adventure and Outdoors camps that involve water activities (canoeing, kayaking, tubing), participants will need to pass a swim test at the pool on the first day of camp. This basic test involves swimming a short length of the pool and treading water for a short time. If your child does not pass the swim test, they will still be able to swim in the pool during camp, but may not be able to attend a river or overnight trip if that is part of the camp's activities. The Camp Director will discuss this situation with the parent should this occur. What if I need to pick up my child early one day? Some Adventure and Outdoors camps travel around and outside of Howard County during the week, so picking them up early may involve a longer drive for you! Sample schedules are shown above for Adventure and Outdoors camps, but the final schedule for the week will be handed out on the first day or in the letter you receive in the mail (about two weeks before the start of each camp session). The Camp Director will be able to give you a specific idea of where they will be and when, as well as directions to any camp locations if they do travel. Feel free to call the camp coordinator before camp starts or discuss this situation with the camp director on the first day of camp. Please understand that the group will not be able to alter their schedule or route to accommodate early or late campers. Oh no! The camp I wanted is full! We encourage early registration to ensure your child has the summer camp experience they want! Should a particular camp fill before you are able to register, please place your child's name on the Wait List for that camp - there is no charge to go on the Wait List; that is how we judge additional interest and Wait List customers will receive the first chance to enroll should there be an opening or an additional section. There is NO guarantee that there would be an opening or that we could offer additional sections (resources are limited and there are a lot of factors that go into such a decision), but we strive to accommodate all participants. We're going on vacation and my child will need to miss a day of camp - can they still attend? Please give the camp coordinator a call to discuss the situation. There are a lot of details covered in the orientation and other activities on the first day of camp, so often missing the initial day will mean your camper will not be able to come to camp and participate in certain activities. There is no refund for missed days/activities of camp.